Golem played our wedding in Brooklyn and did an amazing job setting exactly the right tone—the perfect mix of classic Jewish music with skillful & soulful takes on the secular classics, kept a diverse wedding of religious Jews, secular Jews, and goyim dancing their tushies off with equal aplomb throughout the whole night. It was the perfect soundtrack for a perfect night. Annette was amazing to work with—set our minds at ease, and not only about the music. A consummate professional. We heard from tons of our guests throughout the night and since that it was the single best wedding band they had ever heard. But Golem is much more than a wedding band—the fact that they are a solid unit that plays together or not at all meant they had a cohesiveness that brought the kind of energy you get at a concert, with the passion, intimacy, and joyousness of a wedding. We cannot possibly recommend Golem highly enough. Sign them up TODAY. I'd been asking Golem to play my wedding for a decade, having seen them live 20+ times. Once I found a bride, I finally had the Golem wedding I'd been yearning for--and still they blew me away, exceeded expectations, and impressed everyone. For both my wife and me, having Golem play our wedding was a dream come true. Golem's typical style is klezmer-rock, but they excel at so many styles when they play weddings. There were myriad highlights, from the epic, rockin', couldn't-get-it-out-of-my-head-for-the-whole-honeymoon hora to the air-guitar-inviting "Johnny B. Goode." It was surreal when my wife and I would be walking around mingling, and then all of a sudden I'd hear songs I love and insist we run to the dance floor. They did a fantastic job for "Can't Take My Eyes Off You" (our first dance) and "Sunrise Sunset" (the father/daughter and mother/son dance). More so than any individual song was the totality of all. Golem played a varied set that was great whether the tempo was fast or slow, the songs familiar or unfamiliar, the language English, Yiddish, or other. At different times, Jeremy's violin, Brandon's guitar, and Curtis's trombone stood out and shined exceptionally. The rhythm section of Taylor on bass and Tim on drums was superb. Especially looking back at the video, wedding guests from all generations were dancing and having a blast. Countless people gave rave reviews! My mom was wowed and thought they were perfect, despite finding something to complain about with the music at every other wedding and bar/bat mitzvah. My father-in-law keeps saying that Annette has a beautiful singing voice. A lot of people praise how Aaron (the other singer) has such lively, exciting personality in his performance. Based on Golem's acoustic playing at the prelude and recessional for the ceremony, even the rabbi remarked how great they were. Golem played at our March 2016 wedding. They were so much fun! We loved the ceremony music and they kept our guests dancing all night long. They play a fantastic mix of traditional music as well as originals and classic wedding party music. Our guests keep talking about how fun our band was and we couldn't agree more! Golem is the best wedding band. To me what sets Golem apart is that they produce their own CDs, write original music, and play gigs around the country as well as internationally so they're musicians that really gel on stage and enjoy what they're doing. They have a sound and vibe and their repertoire fits this. The bands leader, Annette, was great to work with and provided us with suggestions for the processional and first dance. They kept people on the dance floor all night long and our wedding was a Sunday night! One of the best moments was at the end when Golem played their last song and all of our friends started shouting "one more song!" And they did an encore for us! They're just all around a very cool, very fun band! Golem is by far the best wedding band I've ever heard/seen. They have the right balance of quirkiness, original music, cover songs that appeal to all generations, energy and personality. We had a Jewish wedding, which they do SO well, but I would recommend them for non-Jewish weddings too. They played our ceremony, cocktail hour, and reception. If you want a wedding where your guests will be on their feet constantly, choose Golem. We've received so many compliments on Golem from our guests - young and old. Our guests are still raving about them, and it's been 2 months since our wedding day. If you are looking for a band for your wedding and you want one that will induce a dance party that doesn't stop, Golem is it. They were absolutely phenomenal at our wedding, and we heard nothing but rave reviews from our guests, photographers and the staff at our venue. Reasonably priced and fabulous to work with, Golem made the event. 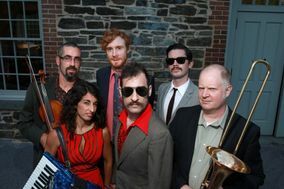 Although Golem plays punk/hipster klezmer music in concert (and is awesome), my husband and I are not Jewish and our wedding guests were a mix of New Englanders, Oklahomans and New Yorkers -- some Christian, some Jewish, some neither, both young and old. Annette, Golem's band leader, had no problem weaving together Golem's original music with rock, big band and country covers that appealed directly to our guests. There was not a single guest who did not get out on the dance floor. In fact, we had a hard time ending the party because everyone wanted to keep dancing. Annette is a true professional and easy and fun to work with during the entire wedding process. Check out their website and talk to Annette. From their wedding repertoire, she will figure out a musical selection perfect for you. And their electric guitarist is awesome. Everybody loved the band, every age group, professional musicians... just Everybody. They are one of a kind FABULOUS.